Pancakes are definitely among the top favorite foods of people all around the world, but they aren’t always a healthy choice. That’s why we decided to create a morning alternative recipe that will be both healthy and delicious. If you are a fan of pancakes but also follow a strict diet, then these are the right pancakes for you. A portion of vegan protein pancakes enriches your body with protein for your muscles, nuts, and seeds that have anti-inflammatory properties among others and berries that boost your energy with their anti-oxidants. We’re sure you’ll savor every bite of this self-nourishing food! Treat your taste buds with this super-simple, healthy and delicious breakfast alternative! To make vegan protein pancakes, take the chia seeds and mix them with 6 tbsp of water. Let them soak. Mash the mixed berries in a pan. Put them on low-medium heat until they become syrupy and bubbly. Remove the pan from the heat and mix in the flaxseeds, maple syrup, and lemon juice. Let it cool. Take the ground almonds, almond milk, flour, applesauce, maple syrup and a pinch of salt and put them in a blender. Stir the chia seeds to check if they became thick and gloopy and then add them to the mixture. Mix all until you get a smooth batter. Prepare a large frying pan and heat 1tsp of coconut oil on the medium fire. When heated, add dollops of batter. Cook for a couple of minutes until bubbles form on the top side. When the top turns to sandy color, turn over the pancake with a spatula. Set aside and keep warm, until you repeat the process with the remaining batter. Remember to add coconut oil with each pancake. You should get about 16 pancakes. Pile the pancakes one on top of the other and put jam between the layers. Make a stack of a couple of pancakes and decorate the top with a spoonful of jam. If you prefer, you can scatter some fresh berries and nuts as well. Enjoy! You can also add Greek yogurt on top of the jam, between the pancake layers. And for garnishing the stack, you can use chopped (and/or toasted) pistachio or pumpkin seeds and hemp seeds. You can even add nut butter or figs if you like. 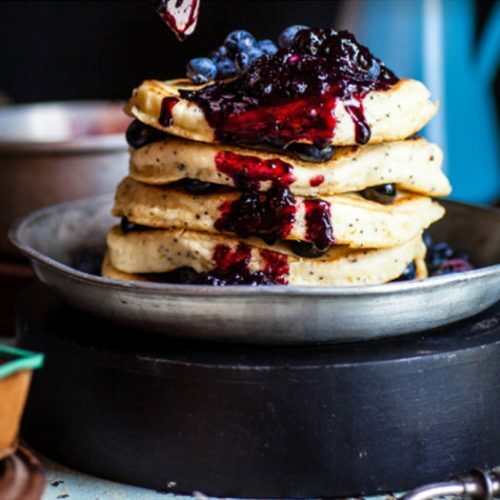 These pancakes taste great with a chilled glass of flax milk! Mia Johnson is a Sydney-based writer. She is passionate about helping readers create nutritious meals and make healthier life choices.